What happens here changes the world…of sports. I recently came across a graphic known as the “Rootability Curve”. 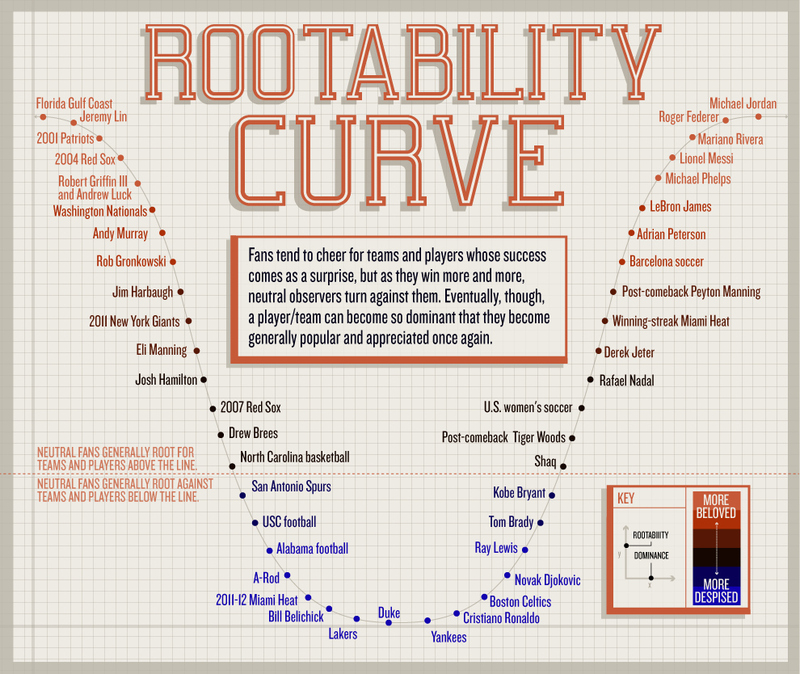 In general, the Rootability Curve illustrates what general fan support for teams and players looks like. As one can guess, high on the Rootability Curve sits the underdog champion. However, the more this underdog continues to win, the lower on the Rootability Curve they move. By becoming so good that they begin setting records and creating events out of their skills, the public once again roots for them and they move back higher up the curve. As far-fetched as this idea may seem at first glance, the more I looked into it and thought about it, the more I agreed with the logic behind the theory. There was a time when I rooted against Peyton Manning. Since his surgery and comeback, I root for him. Furthermore, the team at the very top of the beginning of the Rootability Curve, the Florida Gulf Coast basketball team, is a team that absolutely exemplifies the idea that everyone loves an underdog. I found myself researching everything about and rooting for a team that I had no idea existed before March Madness of this year… and I got genuinely sad when they lost! So, in my opinion, the Rootability Curve is more of a fact and less of an equation. What do you think? I’m sure that you have heard of rewards points programs before. Whether it was airline mile rewards or credit card reward points. A new development, however, is sports fan reward points. There are sports teams who grant people points for doing things like reading articles, watching videos and sharing content on social media. Once you have earned enough points you can use them to get rewards like discounts on merchandise and tickets. Many see this as a great way to get fans to engage the team. Fans can see themselves as more important to the team if they’re the highest ranked in social media activity for the week. However, this is really just a cheap ploy made by the front office. This type of program promotes phony fans. These programs confuse the amount of articles shared on facebook with passion about the team. Teams should not be catering to the fans who will like videos in order to earn enough points for a 10% off coupon. They should cater to the fans spend their hard earned money to buy a few tickets a season. They should cater to the fans who pack their arenas night in and night out, who cheer on their team despite the results, who create the electric atmosphere inside of the stadiums. THAT is how you develop a passionate, die-hard fan base, not by courting reward-chasers on Twitter. If you were Jim Dolan, would you rather have Madison Square Garden filled with 18,000 screaming rabid fans engaged in the game on the court, or 18,000 phonies checking their newsfeeds and timelines, oblivious to the product on the court? Is social media the next NFL Draft expert? The weeks leading up to the NFL Draft are always filled with speculations about which athletes are going to be drafted and in what round, but many of these are just rumors and opinions. It’s hard to know who to trust, but what if social media provides all the insight we need? iProspect is an online marketing company that tracks mentions on Facebook, Twitter, blogs and other social media platforms to predict the draft’s top picks. The players that are mentioned the most are matched up to the draft order to project the top 10 players selected. The online company did this same study last year, and the results were surprisingly accurate. They correctly predicted six of the top 10 picks, with the remaining four being off by only one place. 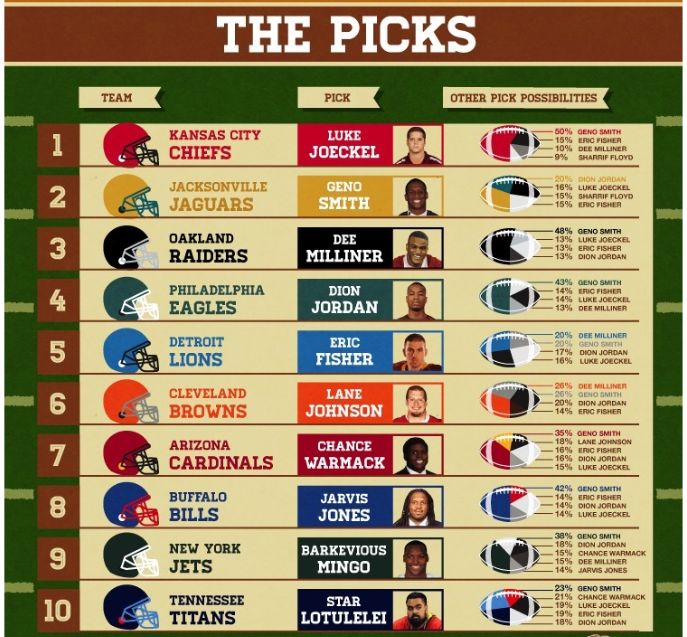 Check out their predictions for the 2013 NFL Draft and stay tuned to see if they were accurate! In “Does Money Buy Championships?,” an online article by Scott Kaufman, payroll gap by sport and champion diversity by sport are analyzed, along with a deeper look into baseball’s spending payoff. It’s long been known that payroll inequalities exist, however is the extra cash flow actually necessary? When looking at champion diversity, I’d venture to say ‘yes’ in some sports and ‘no’ in others. When looking at baseball in particular, I’d venture to say sometimes. In recent years the top ten spending teams have made it into the playoffs 30-50% of the time… and that doesn’t necessarily guarantee they make it far. Known for a massive payroll, the Yankees have made it to the playoffs almost every year for the past ten years. However, looking at postseason results they have only made it past the ALDS five of those ten years. Referring to current times, I’ll address my Texas Rangers’ latest opponent: the Los Angeles Angels of Anaheim. Going into this season, the Angels were commonly referred to as the “new” Yankees, having reached almost $140M for this year’s payroll. Unfortunately for Los Angeles, thus far their record hasn’t reflected this spending, sitting at 8-11. So what do you think? Is LA just heating up and this spending will eventually pay off or do you think the club has been handing out undeserved cash? In the sports world, a lot of action can happen fast at all hours of day or night. The real challenge is to know whats worth being on a social media medium. Each social media platform has it’s own requirements and standards. In saying this it’s very important to know if you want to market to consumers througth each medium. The differences make them special tool to use. The rules about each one can easily be found. I am not sure who makes these rules up but the majority of it is common sense. One of the concerns about twitter is that it virtually gives athletes a podium and microphone to say whatever they want to EVERYONE. For some athletes, that is not a problem. They know what they tweet will affect their public image, which in turn could affect their income. For others, those with “character concerns”, this could be very troubling. But there is another class of athletes on twitter who are definitely at risk. College Recruits. As a student at UT, I am predictably a fan of the Longhorns. When it comes to UT’s recruiting campaigns, news is hard to come by without paying for monthly subscriptions. The most reliable info comes from public forum websites and college football writers on twitter. Recently, I also started following some of the high school football recruits who are committed to, or likely to commit to, UT, despite the unsettling knowledge that I now follow a handful of high school juniors. This as an attempt to get news straight from the source, I will now know what schools the recruit is considering or visiting, their thoughts on UT, their in-season developments. The problem is, that once you follow a high school football player on twitter, you don’t just get his recruiting updates, you get EVERYTHING. My timeline is now cluttered with high school gossip, complaints about TAKS, high school girl drama, and all of the other tweets you would expect from high school kids. Not to mention the fact that some of them may tweet upwards of 100 times a day! While I didn’t expect all of that, I accept it. I look past the evident immaturity of these kids, and laugh at many of their antics. But many do not. Within some of the public football recruiting forums, these kids are often criticized for their tweets. And they hear it too, because they look in these forums. Although it was never said, in the case of one recent decommit, this criticism was likely a factor. Obviously, people are not going to stop following their favorite athletes on Twitter. But it is clear that these kids are not prepared for the scrutiny that comes with having a large twitter following. There is a lot of talk in the professional leagues about training players to use social media effectively, and that is starting to gain leverage in college programs too. It may be smart for some of the big time high school programs to start some sort of program, as well. The post-workout feeling is one of satisfaction, gratification and fulfillment. However, the executives at Nike believed they can take that feeling one step further. On Tuesday, Nike announced an update to its FuelBand application for IOS devices that lets FuelBand wearers upload a photo, tag their location and post their accomplishment to Facebook. 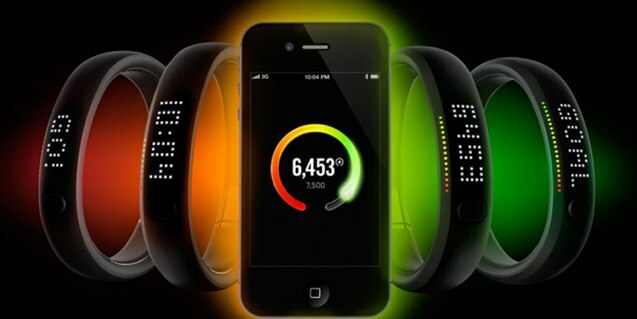 As if self-contentment was not enough, now FuelBand users will be able to have their Facebook friends recognize their success through “likes” and comments. The update is designed to enable users to capture photos of what they have accomplished such as a huge hill they just climbed or the bench press bar they just lifted. There is even a customizing option where users can add their current NikeFuel Score and the Nike+ logo to the actual photo itself. The update will still contain Nike+ Friends, which lets you access custom leaderboards in the app showing how your performance compares with that of your friends who also have a Nike+ FuelBand. Leaderboards can be viewed for today, yesterday, this week, and last week. Nike is always coming up with new innovations for the world of sports. The idea behind this NikeFuel band and its social media aspect is to generate more desire for exercise in the minds of the consumer. In a world driven by social media, it will be interesting to see how the digital aspect of the NikeFuel band will continue to grow.